On the 8th November the Association for Geographic Information held their 2018 conference at the Royal Geographical Society in London. Their focus was on productivity - how Location Intelligence can deliver a more productive economy. There was a wide range of speakers in attendance and they provided a diverse take on productivity with some hitting the mark more than others. If there was a common takeaway from the conference it would be about the growing size and availability of data. More on that later. Helen Bartlett, Data Manager at the MET Office spoke of their new climate change dataset - UKCP18. The raw data has already been released but November sees the launch of the full service. The UKCP09 service will cease at the end of 2018. The 2009 data will be archived at the Centre for Environmental Data Analysis catalogue. The maps & reports for the 2018 key findings are available as PDFs. Raw data should be available this month. William Priest, Chief Executive of the Geospatial Commission announced a £1.5 million fund for crowdsourcing applications to improve local services. Oliver Dowden CBE MP reinforced unnecessarily the link between innovation & geospatial in driving productivity in a speech reminiscent of Yes, Minister. There was no mention of the impact of Brexit which is a shame because that’s exactly what would have been interesting. Catherine Mealing-Jones, Head of Growth, UK Space Agency announced that research & development projects will be able to access remote imagery / radar data through the UK Space Agency’s Space for Smarter Government Programme. Again it would have been interesting to get the UK Space Agency’s perspective on Brexit but nothing was said on the matter. Martin Stabe, Head of Interactive News at the Financial Times provided an fascinating presentation on the 400 years history of cartographic journalism. From expensive woodblock printing of the 17th century to modern 3D map visualisations generated in minutes for immediate consumption. David Blood, Interactive Data Journalist, Financial Times explained the development of the Broadband Speed Map tool. WIthout professional GIS skills they were able to build an application, process national Ofcom data all with QGIS & R. The Ofcom data shows that surprisingly, consumers in some of the most rural areas of the UK enjoy broadband speeds considerably faster than those in the middle of London or Manchester. The data came from Ofcom, OS, ONS and the CDRC. The one criticism he had was of the prohibitive pricing of CodePoint polygons by the OS but maybe this will reach the desk of the Geospatial Commission. Shan He and Giuseppe Macrì from Uber demonstrated kepler.gl - a fantastic visualisation tool developed at Uber and released as open source. 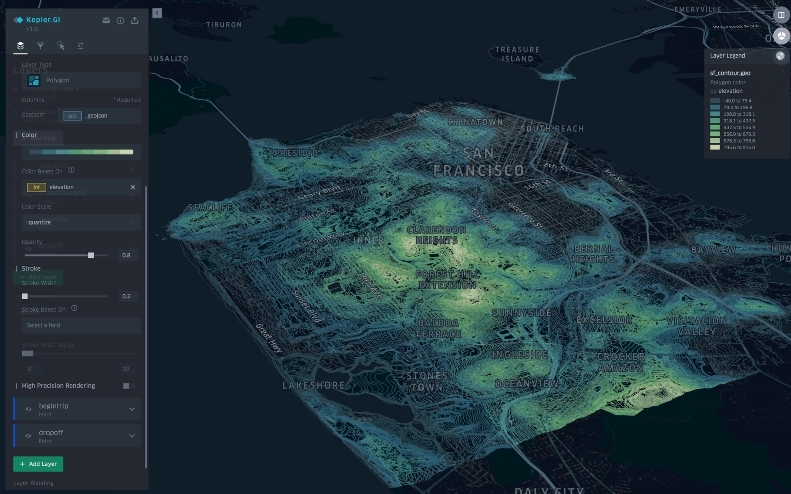 Originally it was designed for Uber to analyze their trip data but has been extended to accommodate the display of other vector data. It supports temporal analysis and aggregation of data. The key point to understand is that the raw data is held in the client browser so they are limited to a browser’s capacity to hold data. For Chrome this is around the 250Mb mark. Shan spoke how gratifying it was to see their tool be used for a wide range of datasets outside of Uber’s remit. They also spoke of Uber’s release of anonymized trip data through Uber Movement. This is a great initiative by a company to assist in urban planning and in part answers a complaint from Andrew Carter, Centre for Cities, that transportation data for regional cities is largely unavailable. It’s impressive to see this behaviour from a commercial organisation and should be commended. All speakers touched on what limits the accessibility of data. This might be pricing constraints or a lack of basic availability. Naturally these kind of complaints refer to other organisations’ data so it was refreshing to see three speakers - the MET office, UK Space and Uber, all make mention of their own release of data. Uber should get particular kudos in this regard because it’s beyond their core business to do so. So if you want assistance in releasing your own data, Astun will be more than happy to help. Metadata, storage solutions and APIs are our bread and butter. QGIS 3.0 was released in February, and although it's labelled an 'early adopter' release, with the long term release (LTR) available in October, there's plenty in it to excite not just the early adopters, but the rest of us too. We've had a chance now to have a good look at it, kick the tyres a bit and see what everyone has to say about it, so here are our thoughts. There are a few big steps forward - for example 3D support and multiple map canvasses - and while many of the other changes are relatively minor on their own, put together they represent a major leap in usability and effectiveness. There's been work on consolidation, upgrades of core packages, efficiency and speed improvements, resulting in a slicker, easier to use and more tightly integrated application. I was chatting to a personal acquaintance recently about work and we got on to the subject of home working. The organisation she worked for was going through a period of change and they were planning on moving some of their office staff to home working on a permanent basis. She was after my views on how we manage to make that work effectively at Astun. This blog, which is very much a manager's perspective, is what I told her! Before we get on to to the two key themes of this blog - the Technical and Cultural - a quick bit about Astun first! 1. Astun's circumstances We employ around 21 people, of which 6 or so work from an office in Epsom, and the rest work from home on a permanent basis. From my home in Bristol, I line manage 13 of those people, 3 of which are office based, the rest primarily work in the UK, as far north as Tyneside & Lancaster and as far south as Southampton. I have one member of the team who is based in Seville in Spain.